This sounds quite interesting, so I decided to give it a try. The word smartphone in the prior paragraph should not be synonymous with just any mobile operating system. At this point, it’s Android, so it’s pure luck that I have a spare Samsung S5 lurking about, which we will test and discuss separately. 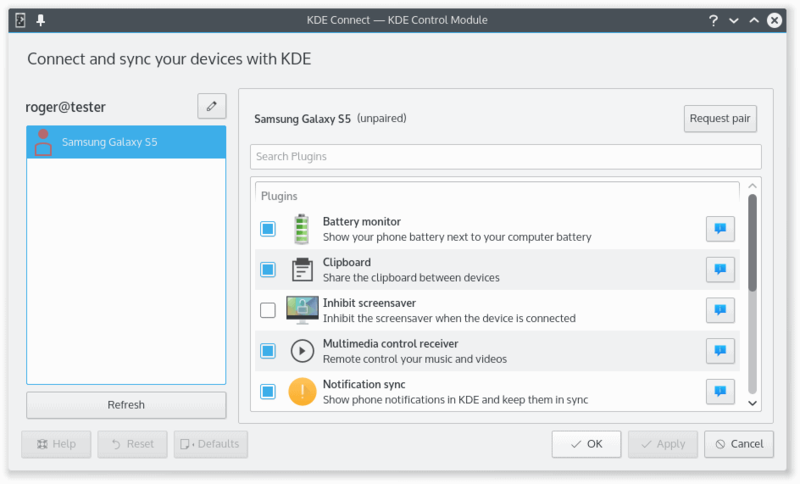 At the moment, let’s focus on what KDE Connect can do. On your Plasma desktop, KDE Connect is already installed. Just fire it up. On your Android, you will find the namesake application in Play Store. Download it and launch it. To be able to see other devices, you will need to join the same Wireless network. Bluetooth connectivity might also work, but from what I’ve read, I wasn’t able to confirm this. Once you have both devices connected to the same network, they will see each other. Initially, the devices will be unpaired, and you will have to authorize the bonding. Like in Star Gate, with the human host and Goa’uld. 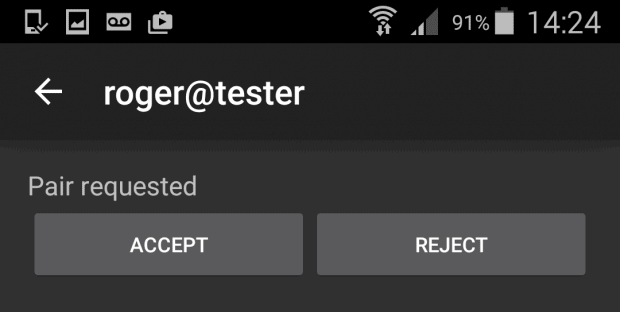 The pairing in a necessary security precaution, as you may have additional Android devices on your network, but then, it would probably make sense to keep them all in sync with one another. This is very similar to any sort of same-network sharing, including various media and display protocols. 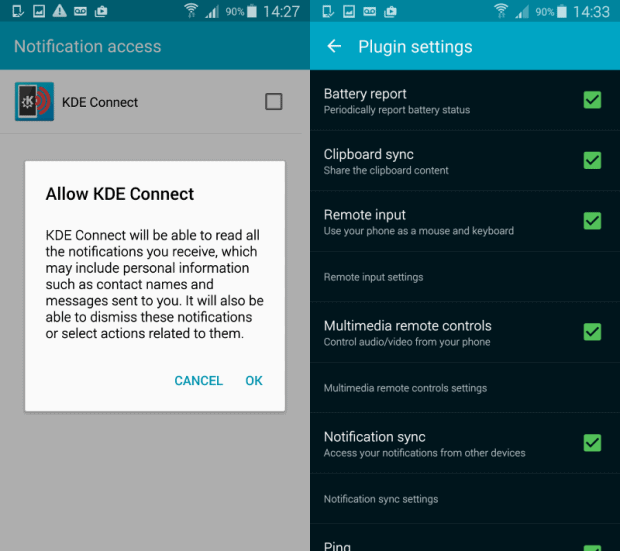 There are multiple things that KDE Connect can do from your desktop, and likewise, things you can do on the smartphone once connected. Different plugins are used, and they let you display notifications about system updates, missed calls, messages, battery meter, and more. 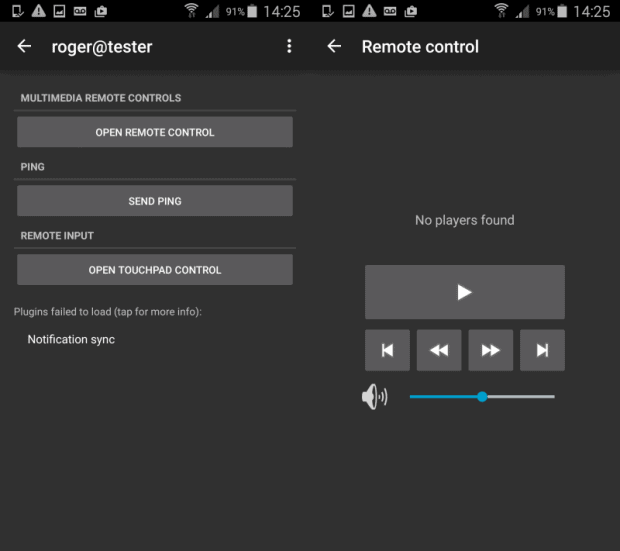 You can also use the smartphone as a mouse pad, or control the media player on the desktop. For the latter to work, Amarok or VLC must be running, or you will not be able to do that. Moreover, most importantly, you need to allow KDE Connect to access your system notifications center, otherwise you will see an error, and the only active plugin will be the battery meter. After you approve the additional access, you will then see the rest of it, which is handy, especially if you like to keep things tidy and managed from one central place. Now the fun bit. Does it work? Well yes. You will indeed get popup messages notifying you about your smartphone activities, like when you take screenshots or receive messages. You can then play music, from your smartphone, on your desktop, and you can even control the volume. 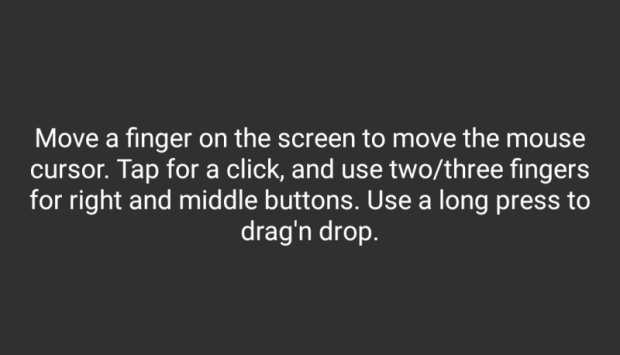 Or control the cursor. Well, not everything was perfect. The first time I tried to allow my laptop to access the phone, the network crashed, and the two devices lost their pairing. Then, when copying files from S5 to the desktop, Baloo terminated unexpectedly, twice with a repeatable segmentation fault. 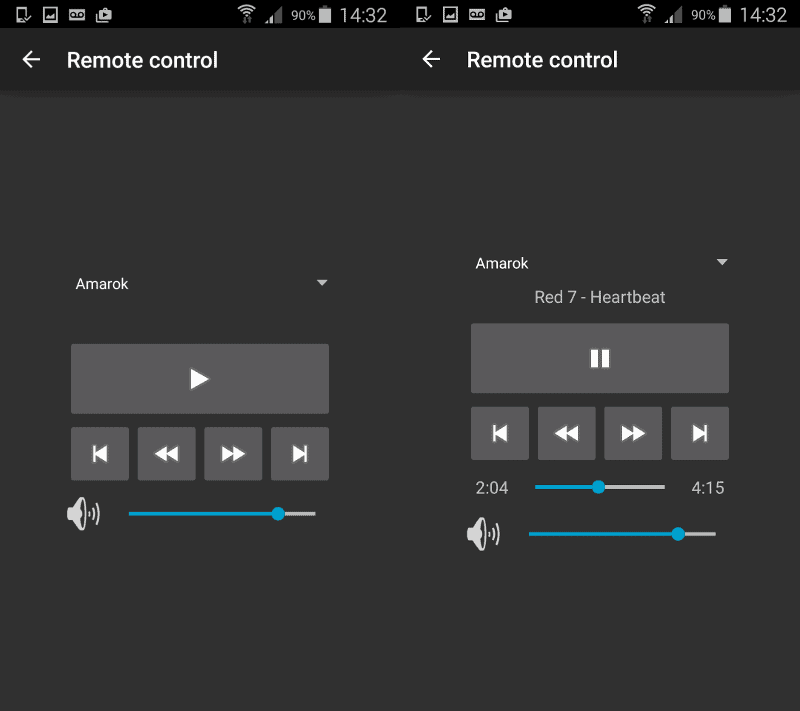 Some of the functionality should be streamlined, like the fact you need to separately launch a media player. It would be nice if you could do that from the smartphone, without manually fiddling with programs. Likewise, the initial notification sync. It stems from the lack of permissions, so there’s really no reason for the ‘failed to load’ error, as it does not feel professional. There should be more focus on offering a seamless, transparent experience. 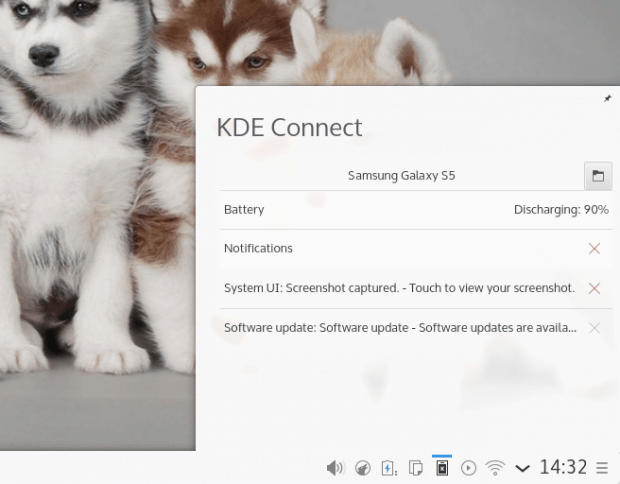 Overall, KDE Connect behaved fine, but it wasn’t stable and robust enough. Even tiny glitches and network interrupts give it a sort of beta feel. Then of course, being able to use your smartphone in this manner is a useful thing. However, only one operating system is covered at the moment. It would be great to see all other big players included, and of course, let’s not forget Ubuntu Phone, either. I like the concept. 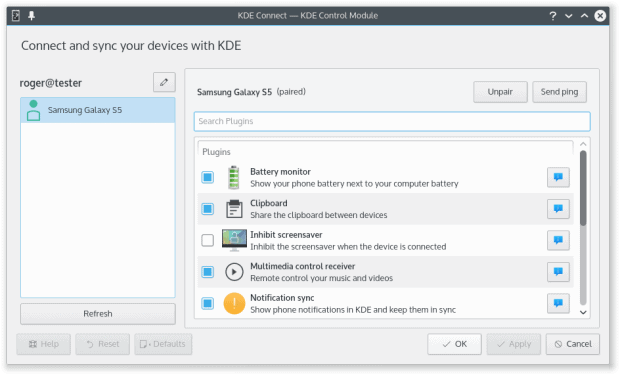 KDE Connect is a bold move into the mobile space, but then, Plasma has always been present in the smartphone space, or at the very least, non-conventional, non-desktop domain. 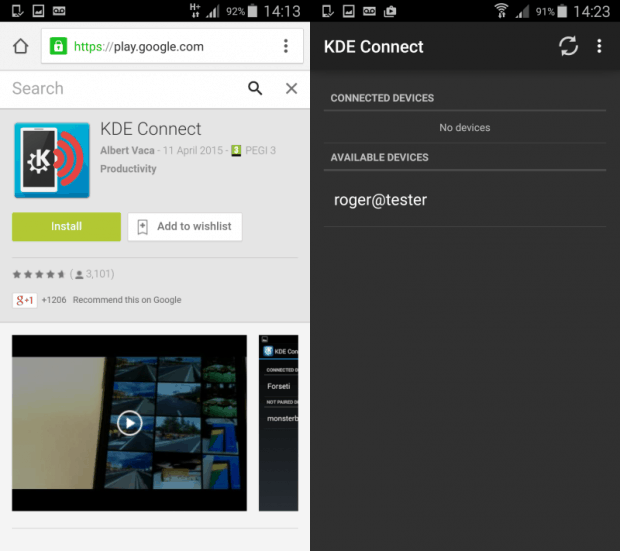 We may one day see a fully fledged KDE offering on a phone, which could be a neat thing. In between, KDE Connect offers mobile users an easier way to integrate their devices into their operating system ecosphere. Being able to do this on a Plasma desktop is a bonus. Of course, the program should definitely be renamed to reflect the new product tree, and it needs more polish and love. Namely, various bugs and problems should be fixed, smoothed, made redundant, because all and any error that users see will just drive them away toward simpler, more transparent solutions. But it’s a neat, practical first step. Now, let’s see if it can mature and grow to include all the other mobile platforms, and then, extend the functionality across the board. Not just media player, but maybe a whole media center. Perhaps Plasma Media Center, on your phone? Now, things start to look quite interesting. I shall definitely keep an eye on this little thing. Oh, many thanks to all of you who have bothered emailing me and exposing me to KDE Connect. Stay tuned for updates. 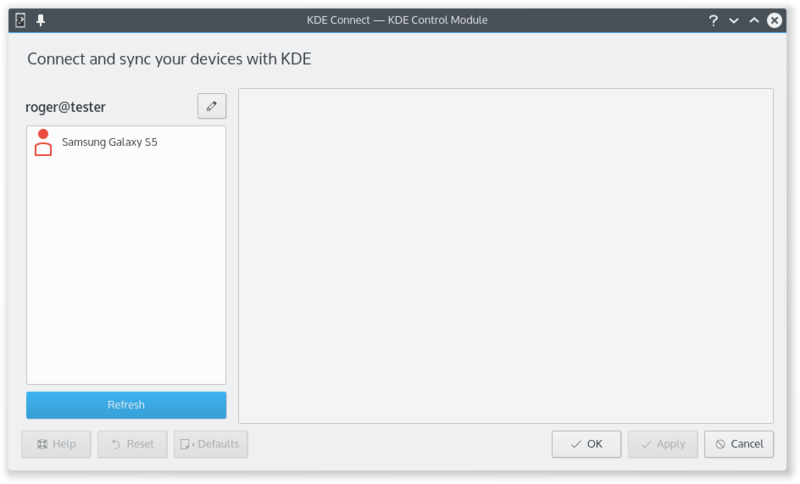 I’d like to point out that KDE Connect works across all Linux desktop environments, not just KDE. I’ve run it on LXDE, Cinnamon and Lumina successfully. So long as the kdeconnect and kdeconnect-notification packages are installed, the software is desktop agnostic. I’ve run it on Unity and Cinnamon, all good. This makes sense, since Clementine has the same code base as earlier versions of Amarok. In fact I think that it is more related with mpris support or something like that. But what you said is true. In fact I prefer the inherited interface of Clementine than Amarok 2. This is a fantastic piece of software! All the features work fine on my system. Thanks for the recommendation!